Bearing witness to the shared impact of oppression is an invitation to imagine the complete socio-economic and political transformation of such systems in order to secure historic justice, equality and freedom for all. 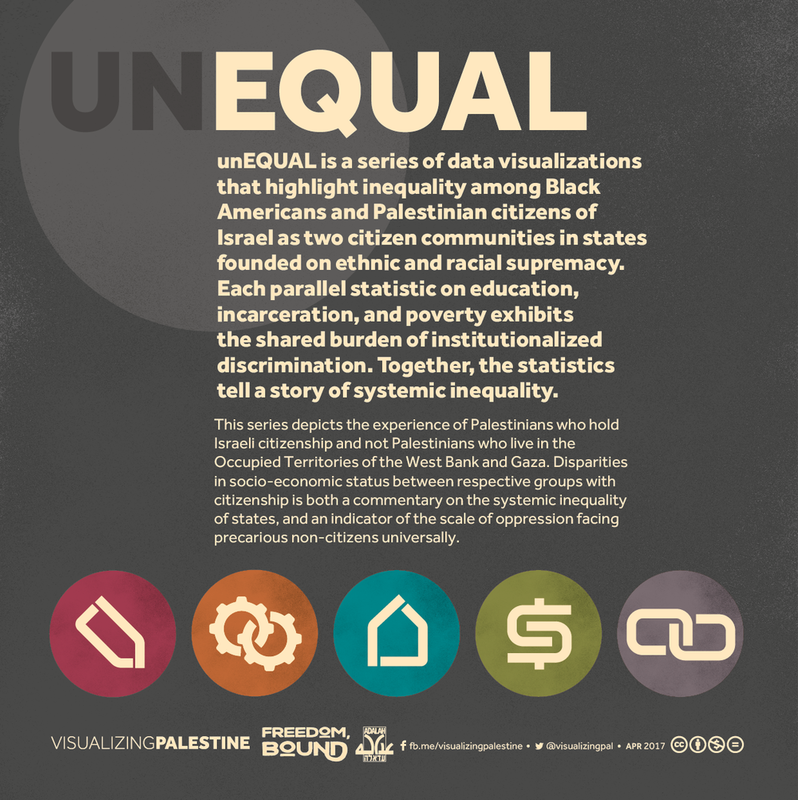 Freedom, Bound has partnered with Visualizing Palestine to produce, for the first time, data visualizations presenting the lived realities of Black Americans and Palestinian citizens of Israel side-by-side. 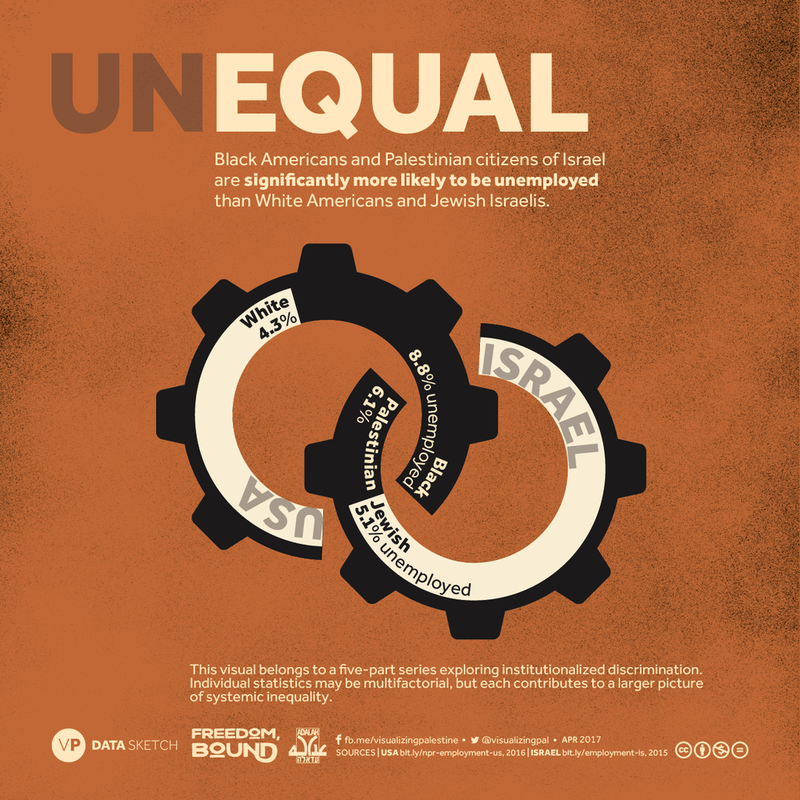 unEQUAL makes visible the shared burden of marginalization, institutionalized discrimination and entrenched inequality on two communities with citizenship in nation-states that have histories and legacies of exclusion. unEQUAL invites the viewer to interrogate why citizenship is not an inherent equalizer in states founded on supremacy and subjugation. 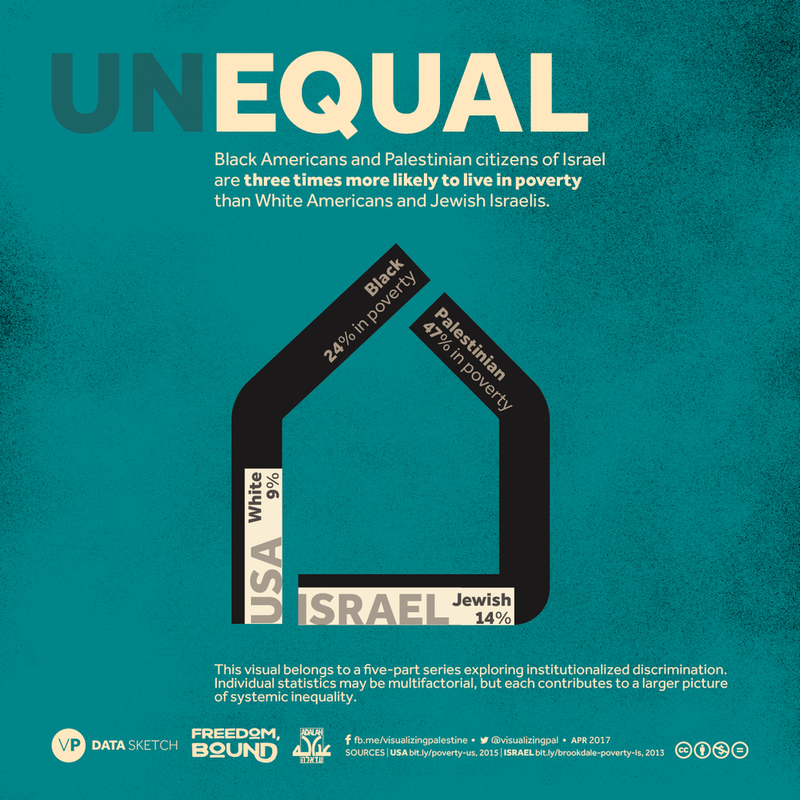 The data draws from the lived experiences of Palestinian citizens of Israel and Black Americans, and demonstrates that marginalization is the inevitable outcome of the design, policies and practices of regimes grounded in ideologies of inequality. Palestinian citizens of Israel make up 20% of the population of Israel, a state that was established to privilege the rights of Jewish citizens, and where there is no right to equality enshrined in law. Black Americans make up 13% of the population of the United States, a state that today guarantees legal equality, but was similarly founded on the myth of white supremacy. Watch the 2015 video "When I See Them, I See Us" featuring more than 60 leading Black and Palestinian artists and activists, and learn more at www.blackpalestiniansolidarity.com. For more information and efforts by our partners, see Partners & Resources.